We are celebrating Laura H as our September Member of the Month! There’s a fun little backstory as to how Laura came to be a member of Iron Clad. I met Dr. Laura in person the first time a year ago when our then-foster dog went to Laura for an exam. I was highly impressed, so I decided to start taking all of our dogs to her. Earlier this year, Zander got really sick. Laura and I bonded during that ordeal, between how she dealt with my traumatic experience with his illness and the excellent care she gave to Zander. She very clearly loves her patients. Shortly after, an email pops up that Laura was requesting a consultation. You see, Laura saw my Facebook post about a podcast I was on. She listened to the podcast in its entirety and was intrigued. She decided she had to learn more about kettlebell training and all that we do at Iron Clad because she knew she needed to incorporate strength training into her lifestyle. It’s no secret by now that strength training is one of the best ways to elicit the feel-good endorphin release of exercise. Focusing on your technique does not allow much thought to other areas of life, so it’s a great escape that way too. As a veterinarian, Laura often works long hours and some days can be quite stressful, having to deal with really sick animals and their worried owners. I’m sure her days are a large, mixed bag of emotions. She knew that she needed this in her life, to balance out those stressors of her days. Laura is also an avid cyclist, having done rides like the Triple Bypass, Copper Triangle, and the Santa Fe Century. Her “recreational” rides are things like Lookout Mountain Road, Mount Evans, Guanellla Pass and more. Her goal is to ride all paved mountain passes in Colorado both ways!! Laura was experiencing chronic back pain on the bike and knew that developing core strength would help resolve or diminish this. That was another big appeal of kettlebell training. Despite a fluctuating and crazy schedule, Laura has been very consistent with her training. Now, 4 months later, Laura is experiencing all of the benefits of kettlebells and strength training in general. Not only is her back pain on the bike diminishing, Laura also feels stronger on her bike, is able to climb longer and more sustained and she is recovering faster. Even her riding buddies have noticed that she is a stronger cyclist! Laura is stronger overall, she has more energy on a daily basis and she’s making lots of progress to more difficult exercises and bigger weights. 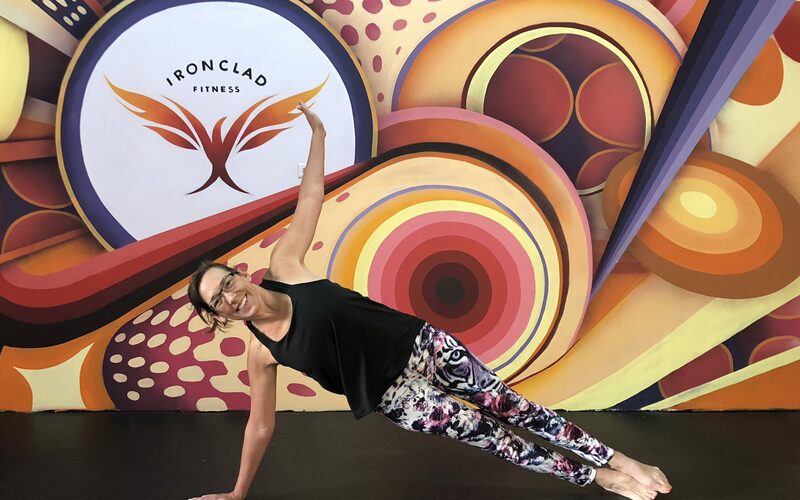 She credits Iron Clad Fitness with helping her prioritize her self-care, which has given her benefits in many other areas of her life. Congratulations on lots of great work and lots of great progress, Laura! !